Amherst Biennial: Rowlett's Walk- About Hits NYC at Dorsky Gallery with some nice company! Rowlett's Walk- About Hits NYC at Dorsky Gallery with some nice company! Samuel Rowlett's performance during the Amherst Biennial was one of the most light hearted performances I've witnessed in a long time. 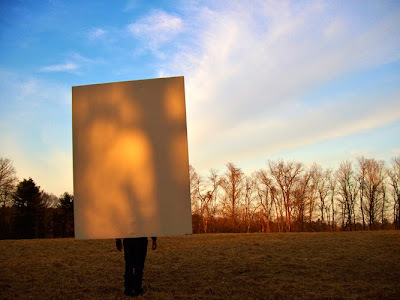 He carried a large canvas on his back (braving wind & traffic) from UMass campus to Hampshire College. The purpose of his performance was to compare an artist's journey in creating a painting to early adventurers' exploring our country.